Recently, Mark Surman (Executive Director of Mozilla Foundation, innovator, cool guy + my boss) recommended that I listen to this Spark podcast featuring an interview with Angel Gambino, who is the co-founder of Rosa Parks- an exciting plan to re-vitalize the neighborhood of Corktown in Detroit. In the podcast she describes designing a creative hub and what physical communities can learn from online community-building. At the very beginning of the interview she says that Corktown is a " interesting mix of different communities in one neighborhood" and goes on to say that it has "magnificent buildings and no people." Coming from Rockaway Beach, New York, a neighborhood that also fits this description quite perfectly, I was quite taken by the project and the passion that Angel Gambino has for neighborhood renewal. In the conversation she discusses how her skills in online community development translate into activating physical communities. This is a passion that I share. 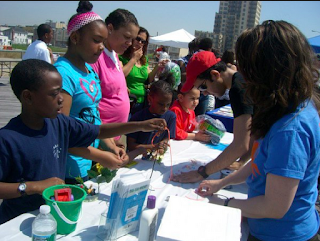 In graduate school, I worked closely with the Rockaway Waterfront Alliance and the Swim Strong Foundation- designing interactive tools to build community awareness and activism around beach safety. While the two projects are obviously quite different in scale, at their core is design spaces that encourage collaboration notably combined with a grass roots LOCAL call to action. Now, if you follow my blog, I am sure you are connecting the dots and seeing the natural connection to the work that I do at Mozilla. In the online melting pot that is the Web, you naturally have a plethora of communities given the opportunity to collaborate. However, I think that something is kind of missing when we (Mozilla) usually talk about our mission. We discuss our desire to "build the next generation of webmakers" - but really, the crux of that statement is in the word "webmakers". Web Makers - someone who is using the web to make stuff. Sounds obvious? Wrong. This is not obvious. A very small percentage of the schools, libraries, community centers, adults and youth who I work with in and outside of Mozilla actually use the web to make stuff. The web is a place to make things happen, to convene, to organize and distribute information- but the idea of making something is a real call to action! Why would you want to make something with the web? I think of my mother, Rose. She is a retired New York public school teacher who is passionate about community development in the real true sense of the word. She has taken it upon herself to learn how to design a website and a facebook group for some of the various organizations in Rockaway that she volunteers for. She makes things on the web and with the web- because she knows that people in her community are of a certain age and aren't running to face to face meetings, but she also knows that her community values those face to face meetings. My mom meets people where they are- and designs spaces for collaboration within the appropriate medium. Because she is a designer of the web, as a webmaker- she is making a mark for how her own community is represented in the virtual and global world, and she is doing on a local level that makes ripples of impact. As Mozilla moves forward with its development of projects such as Hive NYC and its online learning offering in Hackasaurus- it is really thinking about how to build up and support local webmaking, engagement and activism through events, programming and open source resources. The goal is not to build Mozilla's vision for the next generation of webmakers- but for the next generation of webmakers to design their vision for their own local and personal world and ecosystems within the canvas that is the Web. Remember that the web is a hand made thing, designed by individuals- and without individuals representing and defining themselves within this worldwide online community, the world is essentially missing their voice in the conversation and decision- making that happens in this space. I challenge you, reader, to take action in your community. Make local change and impact by making the web!